Subject: Queen version announced. I need to know more!?! I need to know the what,when ,where and how of this. Like: are they going to replace the art and turn this into Standard Generic Queen Production?? That award goes to AEG, for art-directing a charming and quirky-looking card game into generic fantasy/sci-fi land #5,674 (Lost Legacy). In other words, I hope not! I have the original, and would happy to get the special tiles in English without losing the stickman art. I hope they do change the art. Well, there's no doubt about it, they definitely will. It won't sell otherwise and it wouldn't match Queen's line at all. Oh I know it will be a KS just hoping for another avenue. What the regards to a retheme i think it is a given I would be very surprised if they kept the original art and look of the game as it is now. It will be available at retail, so no need for any of us to Ks it. When I read the title, I thought you meant a sequel to the game, named "The Queen of Frontier"
I've been holding off on buying games/backing KS games for when this one shows up. No news on this in months? 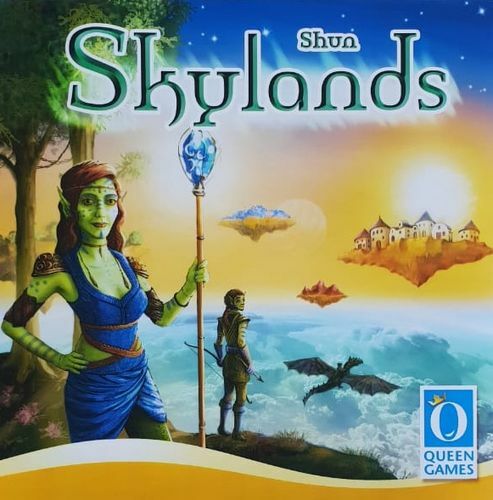 Actually, it was recently mentioned somewhere (I've forgotten where, though) - it's now called Skylands. Not convinced by that cover art myself, but I'll still probably pick it up. Yeah, I find the art of this game a key part of its charm. Queen art is going to be... less so. I wasn't so fussy on the original game's art and was hoping for new graphic design. The character art looks pretty bad, but hopefully the tile artwork will be ok.
Ehhh... was it really necessary to go with a fantasy re-theme? I'm ok with the retheme. It feels suitably distinct from other tile laying games. The art doesn't wow me, but also doesn't hurt anything. Sadly, I'm not ok with the pricing. The choice is to pay $90 CAD now for a quick tile-laying game, or wait a full year for North American distribution with hope the price will be a bit lower - knowing that I'll miss out on 20% of the tiles available (ie: Queenies) if I take that option. Exciting news to see broader distribution, but I'm out on the KickStarter. FWIW watching the recent game night play thru I am really impressed. I totally love the original, but the development Queen has done really (I think) makes the game even better. It feels more fleshed out and a little less likely to stumble. It’s kinks have been smoothed out. I can’t wait to try it myself. Agreed on the pricing - I wonder what queenies they may come up with to make a ks more enticing.